I have always known that Indiana was one of the top duck producing states just like it is a top pork producing state; however, I must admit I have never, ever cooked with duck until today. 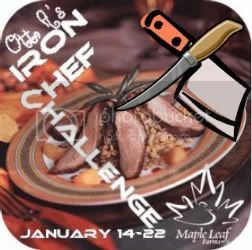 My good bloggy pal, Ott, A, is hosting her very own Iron Chef Challenge just like they do on the Food Network and the secret ingredient for the month of January is duck so I decided to step up to the plate and cook with duck. I knew all along I wanted to use duck from Maple Leaf Farms as they are Indiana's largest duck producer, but I must admit, I was at a loss for how I was going to prepare the duck. Thanks to another great bloggy pal and friend, Gal in the Middle, I found a kid friendly and easy to make duck leg recipe at Itty Bitty Foodies. Thanks to this recipe, I now had a mission to make some scrumptious duck leg; however, I couldn't find any Maple Leaf Farms duck leg quarter at the grocery store. So what's a girl to do... online shopping, of course. Thanks to Maple Leaf's website, I was able to order my duck legs online and they were delivered to my house yesterday afternoon. It truly can't get much better than that. Much to my delight, the duck leg box had a recipe on it that was much like the one Gal in the Middle had found me. Now, I will admit, I am a recipe stickler, need exact measurements, and am not very inventive or liberal in the kitchen with recipes like Leah at Beyer Beware, but today I decided to be brave, I mean I was cooking with duck for goodness sake so why stop there. So I morphed the two recipes into one and have to admit I have quite possibly never prepared something quite so tasty or easy in my kitchen before today and it only took 4 simple ingredients. I simply sprinkled the kosher salt on each of the duck leg quarters and then rubbed it into the already scored duck skin. Added freshly ground black pepper. Then it was time to cover with foil and put in the preheated oven at 350 degrees for 30 minutes. After the first 30 minutes, I removed the foil and baked for another 60 minutes. The duck legs after baking for 30 minutes covered with foil. I mean it truly can't get any easier than this... can it?!? Although they looked done after 1 1/2 hours, I still used my trusty meat thermometer to check the internal temperature to be safe that they had reached 180 degrees. Lucky me, they had reached 180 degrees and then some in that 1 1/2 hours. Now was the moment of truth. Who would actually eat the duck legs at this pig pen? Big Sissy loved her duck leg and Little Sissy even had a few bites which was huge since she hasn't eaten since Saturday after battling the stomach flu bug. Unfortunately, Bubby missed out on the duck fun as he is now taking his turn in the sick rotation at this pig pen. All in all, the duck legs were a big hit at this pig pen. The Farmer even went for some presentation points on his plate. Thank you to Ott, A for making us live outside our comfort zone. I think this awesome Heather! I want Maple Leaf to stock their farm raised duck on the North Dakota prairie because all I have ever eaten is wild duck that we hunt. Although our wild duck is definitely corn fed off our fields! The recipe looks simple and yummy. Thanks for sharing! I have never had duck...pheasant and quail, yes. This makes me want to try it!! firstly I've got to say your presentation with the asparagus on top is very artistic. kuddos to you for presentation!!! Secondly, woo hoo there is duck being served at the pig pen. Can't wait to get some lamb in there as well. Thanks for linking up and I sincerely hope you enjoyed the challenge.